Aquajet(GB) Ltd were engaged by the Environment Agency to carry out a full cleanse of this drainage asset. The condition of this asset was in particularly poor condition. In addition the work was to be carried out under tidal conditions and in a remote location. A significant amount of debris was removed from the drain. As the site was remote, tidal and adjacent to a live railway and canal Aquajet(GB) Ltd coordinated with several other contractors to ensure that both their works and the other contractors works could be carried out in a safe and timely manner. To this end Aquajet had a Manager on site throughout the operation. Specialist equipment was deployed during the works and man entry techniques were required supported by our own rescue team on site at all times. These teams are fully trained to a level that the Environment Agency allow them to work unassisted in the field to an acceptable safety level. Significant groundwork was required to return the asset to the required condition including landscaping, fencing and re-seeding the area. Another successful operation by Aquajet reducing flood risk for the Environment Agency. Aquajet are a preferred supplier to the Environment Agency for clearing, CCTV surveys and other drainage services. With such dedicated staff you can see why Aquajet are thought so highly of. Aquajet GB Limited was contracted by the Environment Agency to clear debris build up from Pocklington Beck. The activity was part of an on-going flood risk strategy following major floods in 2003 and 2007 and was subject to intense public scrutiny. Around 350 tonnes of mainly rubble were removed. Following the clearance of the rubble and debris the beck is now free flowing and the flooding risk has been significantly reduced. However during the course of the works both native white and American crayfish were discovered in the beck. Aquajet undertook to solve this issue with the Environment Agency. Detailed planning was required across multiple agencies. Aquajet staff caught and segregated the two species whilst recording the level of activity. The native species were released downstream away from the predatory American crayfish. Apart from the free flowing beck and significantly lower risk of flooding Aquajet received many plaudits for the way in which the environmental works were handled professionally and in a sensitive manner. 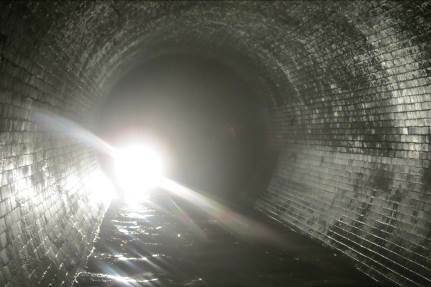 Aquajet are a preferred supplier to the Environment Agency for clearing, CCTV surveys and other drainage services. With such dedicated staff you can see why Aquajet are thought so highly of. 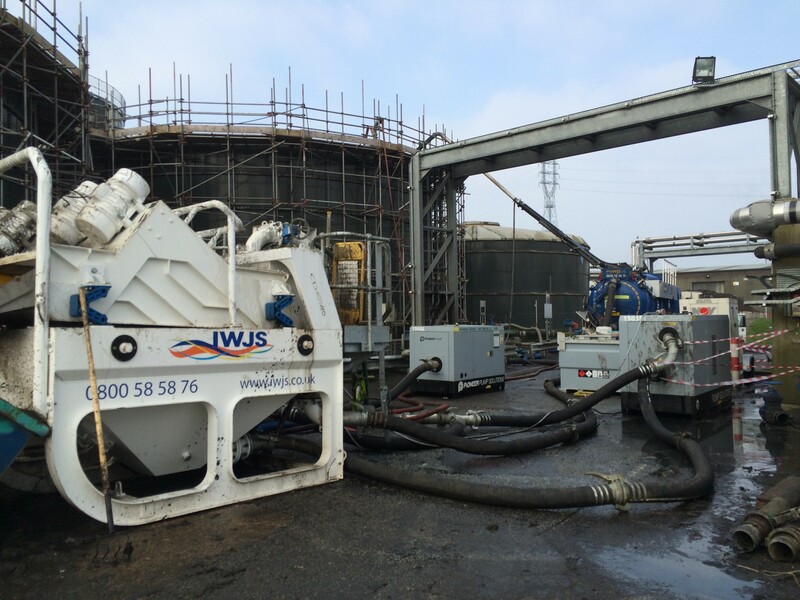 IWJS Ltd were contracted by ELS on behalf of Anglian Water to clean out three large storm tanks, each capable of holding 1.5 million litres of waste water, at the Basildon Sewer Treatment Works. The storm tanks, designed to store overflow waste in times of heavy rain, had 15 years of accumulated debris to be cleared. A phased approach was required as the treatment works had to remain operational throughout the process. Consideration also had to be taken regarding weather conditions to ensure the safety of the IWJS staff. With the volume of debris and waste water present IWJS provided dedicated large scale vacuum pumping, high pressure jetting and screening units as well as experienced operators to ensure continuous operations. 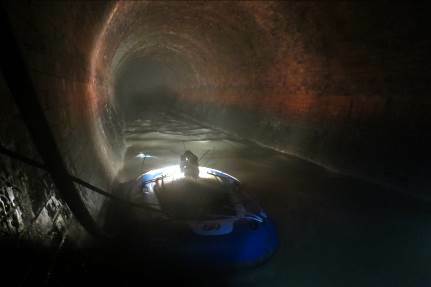 Each storm tank took five days to clear with an additional three days work to clear the surrounding weirs and connecting culverts. The collected solids, up to a metre thick along the bottom of the 58m long tanks, were separated from the waste water for safe disposal. The screening of the waste as well as the recycling of the waste water during the high pressure jetting operations was an important factor in reducing the environmental impact of the operations. IWJS left each tank in a ‘as new’ condition to the delight of the works management team. The IWJS operators were praised for providing a very high level of service within the allocated time scales. The site conditions meant that access to one end of the drain was on rough ground that suited 4×4 vehicles, the other end in tight residential roads a further 30 m on from the end of the relining section. In between, the drain running under houses and other structures. The 2 ½ tonne pre-wetted (resin impregnated) liner that arrived in refrigerated transport on day two was winched through the access point and carefully positioned using the CCTV crawler as the underground eyes. The next part of the process involved inserting a calibration liner inside the resin liner and using water to fill the ‘cali’ to press the resin liner to the sides of the drain ready for the curing process. Safety is always paramount on this type of operation and the weather was constantly monitored. ‘Packers’ were used to temporarily stop the water flow throughout the three days and a Flexline tanker was on site 24/7 to over pump any rainwater if the weather turned. After all, that is the purpose of storm drains. 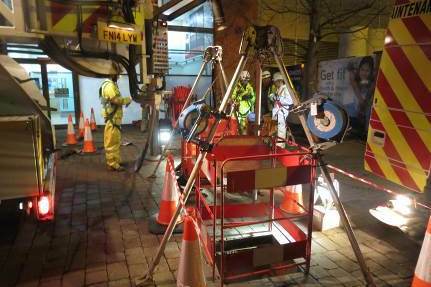 With a written report (including a CCTV survey DVD) sent to the client confirming a successful operation, IWJS have again demonstrated their expertise in the sewer relining and sewer repair sector. Manchester University want to construct a new building over a deep United Utilities combined major trunk sewer. The sewer is a 3.8 diameter Trunk Main located directly beneath the build over site, the precise location needed to be determined prior to any piling and construction works and to ensure the asset was safe from the construction activities. 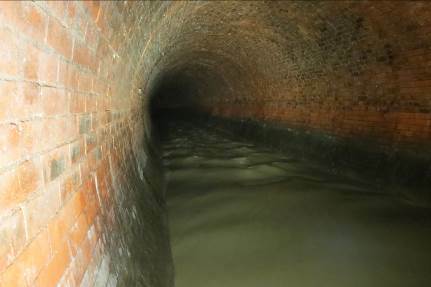 The sewer is constructed in rock with a brick lining and is up to 18 metres below ground level. To assist with the build over design a pre-condition survey was required so that UU could approve the design and sanction the construction. On completion of the build a post construction survey is also required. 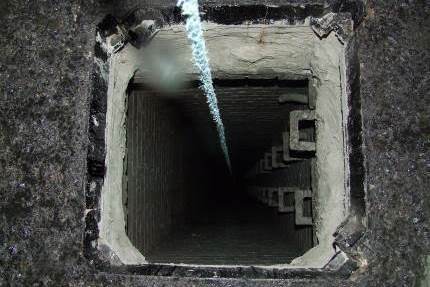 Access to the sewer was problematic due to limited access points, depth, multi landings, high flows and side entries. The sheer size and flow levels also meant conventional crawler mounted CCTV and Man Entry surveys were ruled out. 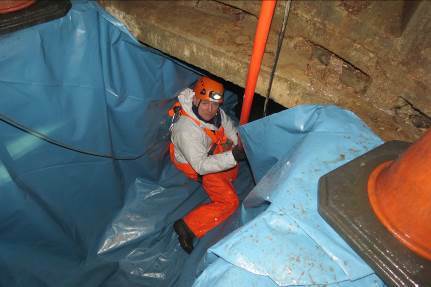 A recce of all located chambers was undertaken to determine equipment access issues, rescue techniques and the survey method. Detailed surveys were undertaken of all manholes and landings supported by diagrams and photographs which enabled the RAMS to be prepared and access permits granted. Following several site meetings with representatives from the University, the construction Design Consultants, United Utilities operational and management staff and IWJS Managers and Supervisors an acceptable method was proposed and eventually accepted once it was vigorously checked by the relevant health and safety departments of all concerned. Using a high volume combination unit as a winch device we towed an inflatable raft complete with a CCTV platform and location probe from a number of limited access points over a period of three night shifts. A four man, high risk confined space entry team were required to position the equipment and inflate the raft below ground using protective sheets to avoid puncturing the floatation device when installing and retrieving it. The whole project was supported by a six man IWJS Rescue Team complete with BA equipment in case of safety alerts or in sewer incident. During the survey an above ground mapping team was engaged to locate the sewer using a transmitting sond attached to the raft which was picked up on the surface with an RD7000 radio detection device. All points marked on the surface were then surveyed using a GPS unit which accurately pin pointed all signals received to enable the sewer route to be created on a CAD drawing. IWJS made significant savings recently for client Anglian Water and main contractor Morrisons at Cliff Quay in Ipswich. This was achieved through the use of the portable screening units employed by IWJS on the site that effectively reduced the original volume of water to an absolute minimum for the client. The waste was thought to contain approx. 30% rag 25% grit with the remainder being sludge. Man entry into the tank was not possible so all works had to be done via the roof access and then the side hatch later on; entry was made once no more waste could be removed using this method. Historically, traditional methods would use a tanker to transport the entire waste volume to licensed disposal which, in this case would cost approx. £120k for the tankering & disposal alone. With access being limited and the tank filled with old heavy ragged sludge and grits a standard suction combination unit would not be able to extract the waste. IWJS deployed a Flexvac air movement unit which has 4x the suction power. To deal with the large volume of waste IWJS proposed to dewater and separate the waste using a screening method. This simple treatment would significantly reduce the amount of waste for disposal and give more options. IWJS deployed 2 CDE MSU:10 screening units, one fitted with a 6mm course screen bed and the other a 75 micron unit. This set up delivers a three-way split for the waste, rag, grits and liquids. These screening units are bespoke to the waste water industry and are built using heavy duty quarry technology parts. They are also very compact, taking up the space of a skip. High pressure water wash bars help to clean the waste and the large screening beds vibrate at high speed to facilitate the dewatering treatment. Few motorways in the UK approach the M62 in terms of the huge volumes of traffic it carries, especially HGVs, on the route between Yorkshire and Lancashire. As the M62 is literally the main artery carrying the lifeblood of container traffic between the major northern commercial ports of Hull and Liverpool. Keeping that traffic flow going constantly around the clock on the M62 is a primary aim of Highways England. With the drainage beneath the motorway and verge culverts being essential, to help remove quickly the high volumes of surface water, thus keeping the primary arterial route safe for traffic. With that purpose in mind, major waste water management company IWJS being a leading player in drain re-lining, was awarded a significant contract valued at £750,000 from lead client A-one+ and main civil engineering contractor CR Civil Engineering. To refurbish aging and damaged drains laid in the initial construction phase of the M62 dating back from 1971-1976. The contract was awarded not only for the solid reputation developed with A-one+ over the last five years by IWJS, but for its leading expertise in using the very latest technology for UV drain relining. Employing state-of-the-art technology that is the most innovative available on the market from German company ProKasro. IWJS was the first company in the UK to adopt the custom built ProKasro 4×4 Mercedes computerised CCTV control unit and its comprehensive suite of robotic UV relining equipment. Adopting the ProKasro system offers the benefits of quicker preparation, superior relining speed and higher product quality in comparison with much older more conventional techniques. Also employed and controlled remotely from within the unit, are robotic cutters which have added further flexibility in adapting existing sealed drains, for them to become effective land drains under the motorway’s verges. With minimal cost and disruption to the drains beneath the verges being key benefits to the client. Work began in September 2017 with the target completion date set for March 2018. Unusual to the project is the high profile it has at night while the contract is underway and the volume of the relining work being delivered on such a major route as the M62. Innovation in managing such a high profile project, required extensive collaborative planning with Highways England and the use of ‘lean’ working to maximise efficiencies in both working and use of resources. Apart from the dedicated Mercedes 4×4 ProKasro computerised CCTV control unit, a Müller recycler bearing the IWJS 40th Anniversary livery, has also been employed on the project. Apart from the major relining work, additional survey inspection, culvert and gully cleaning work and removal of any drain obstructions, has been required as a comprehensive package of services delivered over the project’s life. Delivery of the project has gone ahead so smoothly and ahead of schedule, that this has resulted in the further bonus of new UV relining work with A-one+ on the M621 being awarded to IWJS. I n 2017 major tankering work was awarded to IWJS from leading client McNicholas. The major contract valued at over £350,000 was for water tankering delivery over a six month period during borehole drilling for the primary client of McNicholas, UK Power Networks. The extensive drilling work between Felixstowe to Harwich, required significant amounts of cooling water at the drill heads, on average 400 cubic metres of tankered water delivered each day, for the duration of the contract. The project required extensive planning and scheduling to provide logistical support for the client as was deemed necessary. The round the clock operation met without any hitches, to the delighted approval of the client. One particular challenge of the project other than the sheer logistics of the operation was the fact that much of the vehicle movements were conducted through urban areas. This therefore required as little hindrance as possible to normal traffic flows within built up urban areas, during the prolonged tankering operation. “Further to our previous conversations I write to thank you and the great team of IWJS drivers for all of the hard work they have undertaken on the project, needless to say the last 4 months have been challenging as it’s not often you are asked to supply water at 40m3 to 60m3 per hour for prolonged periods of time. We then for period just to make it more interesting started to increase this requirement to 24 hrs a day, however you still never let us down which is a fantastic achievement. It’s no understatement to say that we would not have been able to complete these works without the support of IWJS and the drivers who took ownership of the task. I am also very pleased to report that for all of the traffic movements through a tight housing estate, in and out of the single road to Shotley, and movements within an operation port at Harwich that I did not receive a single complaint, considering the volume of vehicles and timescale that is a superb effort, well done. Thames Water was presented with what seemed to be an insurmountable and potentially extremely expensive sewer clearance problem. However a solution was found to be at hand, courtesy of IWJS, when they took over this new challenge for major client Thames. 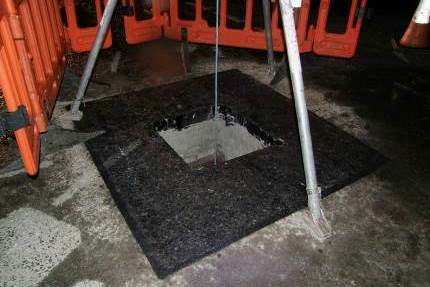 The serviceability of the sewer located at Waterloo in London had become severely affected by 8 cubic metres of C40 high strength, heavy construction grade cement. This challenging situation seemed a thorny problem that could have presented enormous civil engineering costs potentially for the client and caused major disruption. Especially as the sewer was located within a highly busy central London urban area, therefore it was difficult to rectify the problem without affecting traffic flows adversely for prolonged periods. IWJS was therefore tasked by Thames to come up with a more creative, cost effective solution, without resorting to a radical and hugely expensive civil engineering intervention. 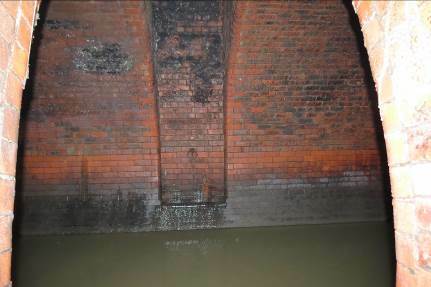 Following a comprehensive survey of the sewer initially by IWJS, to ascertain the full extent of the problem, a full sewer clean was then scheduled. This would follow after the careful removal of the concrete and silt from the 1.2 metres elliptical profile sewer approximately 160 metres in total length. Presented with the task, IWJS examined the problem thoroughly from an open perspective that required lateral thought and ingenuity to arrive at a workable solution. A uniquely creative approach was proposed by IWJS, working collaboratively with civil engineering partners, as this was found to be the best way forward, to achieve a cost effective solution. Thames Water therefore commissioned IWJS to head up and carry out the project. IWJS acted as the principal contractor working alongside First Intervention Team (F.I.T) and major civil engineering partners Amey and McAllister. Early planning meetings took place to orchestrate the smooth delivery of the project and minimalise any disruption to the area. With essential traffic management being arranged to provide a temporary bus stop suspension and pavement closure within 2 metres of the curbside. Due to the busy central urban area, much night working had to be employed to deliver the project with as little impact as possible. 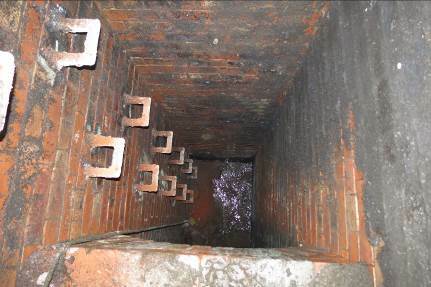 The adopted plan was for the McAllister crews to enter in the upstream manhole outside a public house. 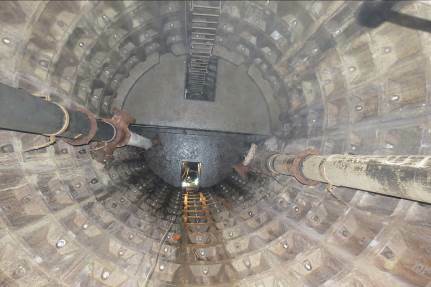 There inserting bungs to stop the flow, enabling the Amey mining crew to enter at the downstream manhole to drill out the offending concrete from the line. IWJS positioned a tanker adjacent to the upstream manhole strategically, to control the flows safely around the clock, enabling the work to continue unimpeded for the teams working below in the sewer. However, upon closer inspection the McAllister teams were unable to insert the bungs, due to excessive silt constricting the line. IWJS then carried out a line clean of approximately 130 metres downstream to remove the silt effectively, thus allowing this essential operation to proceed smoothly as planned. The McAllister team was then able to enter the manhole to insert the bungs and inflate them. Once these were in position and inflated, the Amey mining team was then able to enter the manhole downstream to commence drilling and secure removal of the concrete. With the rescue team (F.I.T.) on hand for all entries into the manholes to ensure maximum safety at all times. The safe removal of the highly tough concrete proved to be a laboriously slow process. However, once all of the concrete had been removed from the sewer successfully, IWJS was then able to carry out a full clean and provided a further monitoring survey to ensure the line was completely free. The end result of this challenging project, to restore the compromised sewer back to a free flowing line, was achieved effectively. Thames Water was highly delighted with the outstanding results attained, with minimal cost and disruption to their services and the area. With the mission being fully accomplished, Thames gratefully acknowledged IWJS for their professionalism and skill in managing such a challenging and difficult project.